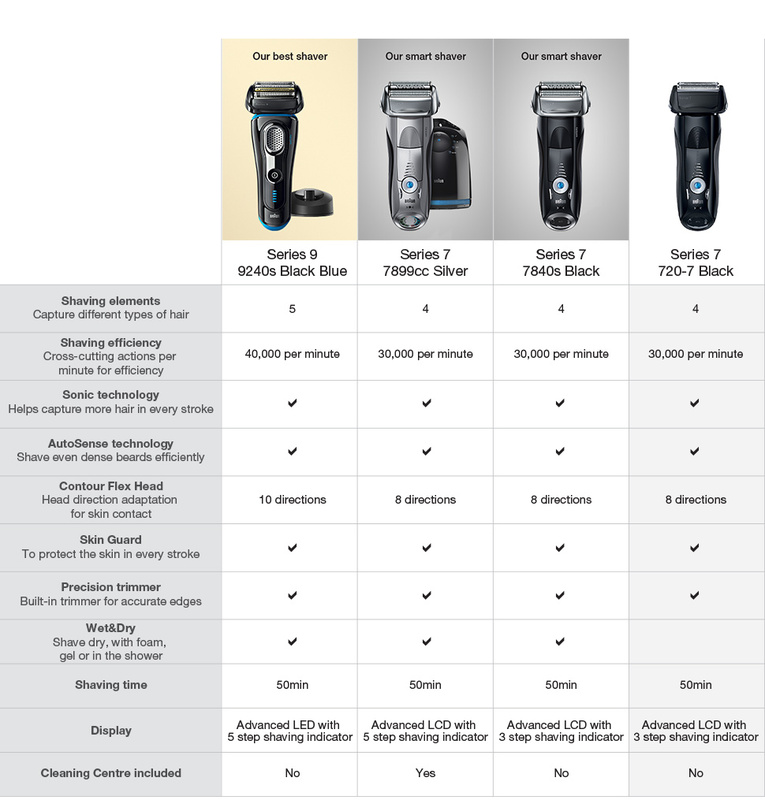 Series 7 Electric Foil Shaver Black is rated 4.4 out of 5 by 49. Rated 5 out of 5 by Gaza50 from Great Features I bought this shaver about a month ago. What attracted me to it was the features and the price. More so the latter. I like the levels of shaving from the sensitive feature to the normal shave. I have sensitive skin so after shaving my skin doesn't feel like it is on fire. The digits are easy to read. The shaving time is good so is the recharge time. The only problem I have is that I have to shave a couple of times as it misses spots. In saying that I think this is a common problem with all electric shavers, the same issue I had with my previous one. Over all it is comfortable to hold, quiet to operate, easy to clean and use. Rated 2 out of 5 by JBla from Didn't live up to its price point Bought this to replace an $80 shaver I was using that broke. Honestly, I expected more from this. It doesn't cut any faster or better despite having an original price of $449 ($199 on sale) and I have to go over the same areas many times to get a close shave. I also get the feeling of having my top layer of skin ripped off while using, and the head of the unit does get noticeably warm during use, not something that feels good. Lastly this shaver also gives the feeling of grit on my face after a full shave, which is an odd thing to describe, but its something I've noticed. A final pass with a normal razor cleans it up. Ultimately I've gone back to disposable razors on warm skin which works far better, and only use this If I'm being lazy. Waste of money. Rated 2 out of 5 by Brad7 from Poor shave I bought this after reading good reviews about the Braun Series 7 Shaver but this one must be a different series 7. The whole point of buying an expensive shaver $200+ is to save you time and give you a close shave. Unfortunately this shaver was slow to remove hair and irritated my skin. I'd recommend people stick to a disposable razor for a better shave. This is the 2nd bad shaver that I have purchased from the Shaver Shop. This shaver is an improvement on the last razor I bought but for the money I'd look elsewhere. Rated 5 out of 5 by Sammy from Glad I got this! Good + Cuts all my neck hairs perfectly without trouble. My neck hairs grow in multiple directions, and lower priced foil shavers have trouble with this, but this one doesn't! Thank heavens. +Quick shave that leaves you skin baby smooth +Easy clean Bad -Noisy, but no big deal. -Pointless strength settings. Highest setting is best. All in all, this is a great shaver. So glad I spent the extra money to get something of high quality. Rated 5 out of 5 by Smooth from Close shave My wife bought one of these for me after dropping & breaking my old shaver. I'm now glad she did. I've had the Braun -Series 7 Electric Foil Shaver for about 3 weeks now & I'm really happy with it. With my old shaver I had to keep a back up disposable razor for when I skipped a day or two shaving over the weekend. The Braun has no trouble shaving closely through the extra growth & is really easy to clean.